"The 9-pointed star-shaped damper on both the front and back of our flat driver reduces the amplitude of edge reflections. The diaphragm itself uses a special inlaid ring which matches the wave impedance of the material like a coax cable does in electronics. 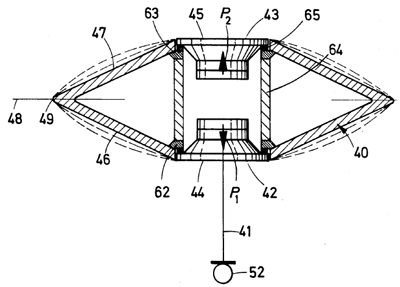 Mechanically the voice coil employs two windings on a single layer spaced adjacent. These windings receive the same signal but run in opposite directions. Their placement means that when one winding is inside the air gap, the other one isn't. Their counter winding compensates for the electromotive force and cancels out back EMF. This generates our very fast 13μs rise time without overhang but also allows for the ±3.5mm Xmax which is quite high for a full-range driver. "Laser Doppler Interferometry images show how our resistively controlled diaphragm begins to concentrically activate from within the small area encircled by the 70mm voice coil. The coincident frequency of such a driver occurs where the propagation velocity of the bending wave traveling on the diaphragm attains to the speed of sound in air. This propagation velocity increases with frequency and makes the coincident frequency ultrasonic or 80kHz in our case to eliminate the phase problems which trouble membranes with higher bending stiffness. By changing the texturized pattern and thickness of the membrane in a controlled fashion, we exploit shearing forces and control the travel of frequencies depending on their sound velocity. With rising frequencies, smaller and smaller areas of the diaphragm are activated. 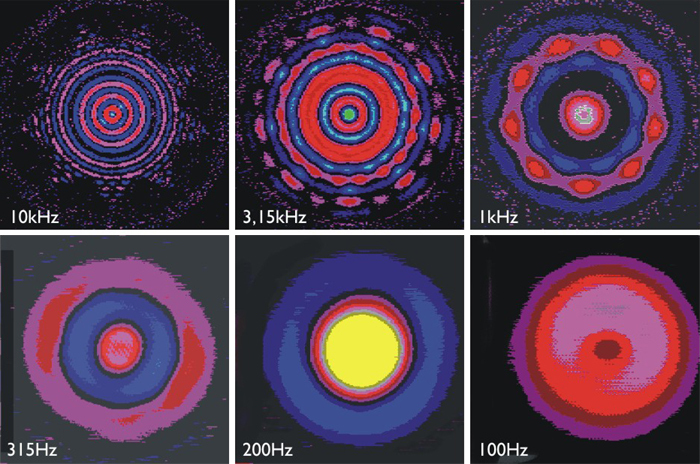 Low frequencies involve the entire surface. Due to the driver's geometry there is no room for the voice coil leads on the inside. Hence four straight wire lengths are visible on the outside. This voice coil is a mere 0.4g in mass and its induction is a minuscule 18μH. That's far lower than any cable or signal-path inductance. 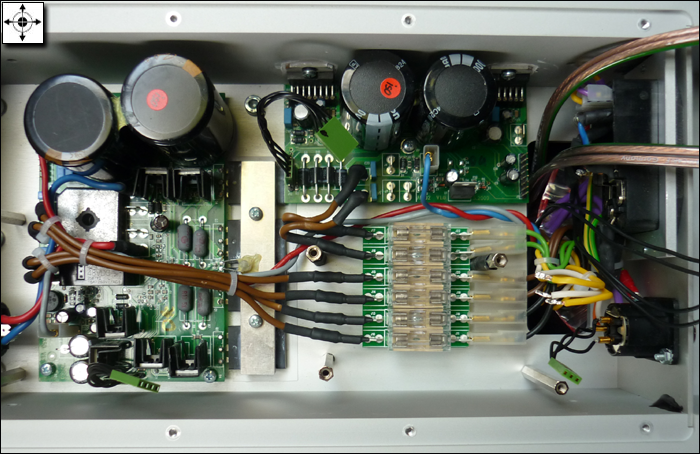 We build the driver in 8/4Ω versions but in the MSMs1 use the 8Ω unit whose voice coil is a bit lighter. "At 300Hz we run a 2nd-order electrical high-pass filter on the MSW which adds to its 12dB mechanical roll-off. Though the driver has useful output to 80Hz, it stops operating as a pure bending wave generator below 200Hz. There it begins to superimpose pistonic behavior on the bending wave. This increases distortion to make unattenuated use down to 80Hz undesirable. The 4th-order low-pass on the polarity-inverted woofer is matched to be phase constant in the crossover frequency window. We're quite mercenary about observing proper step and time response behavior and this mix creates the very best blend between the two drivers. "The air volume behind the MSW is 8 liters. 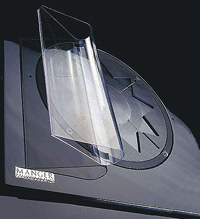 This creates a sealed sub chamber which begins right below the driver and runs diagonally up toward the rear wall. The Burr Brown op-amp based analog filter network is built into the amplifier module while a separate chamber at the base of the speaker houses the power transformer. This leaves 20 liters for the sealed woofer enclosure whose F3 of 30Hz exploits some electronic compensation to extend the raw 40Hz response by another 10 cycles. "Selectable trim pot or switch parameters include input sensitivity of 0.75 or 1.55V; input trim from -2.5dB to +2.5dB over 11 steps; polarity inversion; a 2nd-order 80Hz AV filter; a -6dB nearfield bass attenuator; a 100Hz high-pass adjustment for +3dB/0dB/-3dB/-6dB; 3.25kHz nearfield and home cinema compensation (+3dB/0/-1.5dB/-3dB) where boost addresses placing the speaker behind a projection screen; and 10kHz shelving (+2dB/+1dB/0dB/-1dB/-2dB) which responds to overly damped or reflective rooms. The recessed M8 threads beneath the aluminum plinth can take spikes or other floor interfaces at the user's discretion. We don't provide any. "By request however we can provide Mogami-based XLR-XLR or RCA-to-XLR cables to help interface a customer's cinch or balanced preamp/variable source outputs with our XLR inputs. The two green LEDs at the base are for power and output limiters. By request we can bypass the latter with a jumper at the factory. But they are never in the signal path to begin with since we use optocouplers. When the right LED turns red, it means the limiters are clamping down. Their attack thresholds and release times are different for the MSW and woofer but the latter will always limit first. We specify about 106 to 110dB of sound pressure levels before these limiters engage. 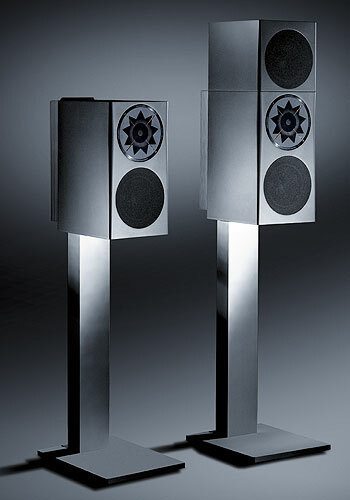 "The geometry of the MSW and its relatively large voice coil imply a given amount of directivity. This means that the response in the time domain isn't completely linear. Instead it forms somewhat of an 'S' shape. My dad always knew this behavior to be a small compromise inherent to his design. Ever since he had looked for a solution. In 2000 we introduced the retrofittable Holoprofile® waveguide to address this imperfection. By increasing the path length of radiation for half the membrane area that is shadowed by the device, the summed output at the ear makes for a flatter rise time without the intermediary 'S' step. With a mechanical acoustic device like our MSW, one cannot pre-equalize for this behavior in the electronic domain. One must do it on 'this' side of the driver as an added accessory and verify the scope of improvement for oneself to decide whether it's desired or not. A pair of removable Holoprofiles is €400. "To my own ears the contours, shapes and outlines of the virtual performers increase in precision with the Holoprofile where precision from any lack of stored energy already is one of the outstanding qualities of the time-correct Manger driver. This add-on wave guide simply improves it further. Focus gets better. That's like removing small shadows in a magnifying glass when you hit upon the perfect bioptic adjustment for your vision. "The MSW amp is a bridged Mosfet affair with 250kHz bandwidth to fully exploit the excellent treble performance of our driver. The SpeakOn connector for the external parallel-connected LF module became a now defunct carryover from the upgradeable monitor version [standard MSMc1 at right, c1 + optional LF module at far right]. This connector will disappear with our next batch of electronic modules for the floorstander. "My dad's first patent dates back to 1969 which was for his unique voice coil. Later he realized that focusing on a woofer wasn't the right way to solve this time-response problem of a driver. This led him to the bending-wave driver by 1974 which began a long slow development of raw driver sales and prototyping complete speakers. 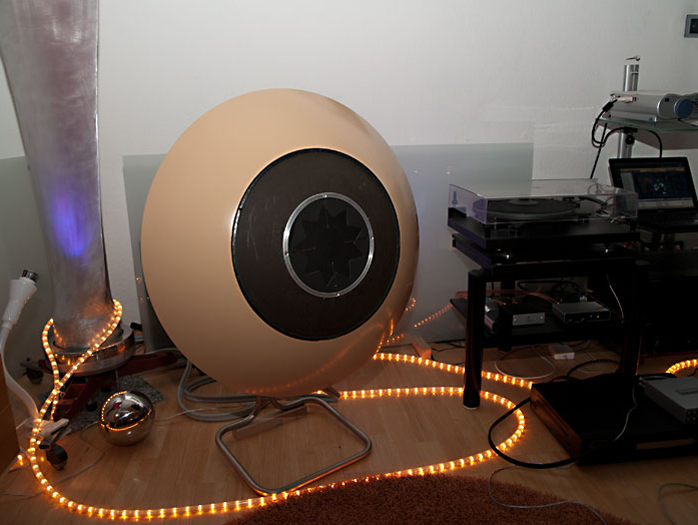 In 1978 he developed the S05 or so-called Diskus speaker which was a UFO-shaped system with one driver in the front and one in the back. "That's when he still believed that his driver could work as a full-range unit when loaded into the proper enclosure. Whilst the Diskus worked just as predicted, the market didn't embrace it. It simply was too different. The driver's poor 76dB efficiency didn't help matters either. "First true success for the Manger driver began in the early 90s. By then the MSW had achieved 86dB. This also forced us to scale up its overall power handling, the mechanical robustness of the voice coil and such. Our first motor systems had been based on Samarium Cobalt magnets. Later we used Neodymium magnets when those became available. This rare-earth magnet type has undergone continuous power improvements since. "That is nicely reflected in the latest iteration of the MSW as the most efficient unit we've yet built. We manufacture the driver in our German facilities and the cabinetry and electronics too are sourced from within Germany. 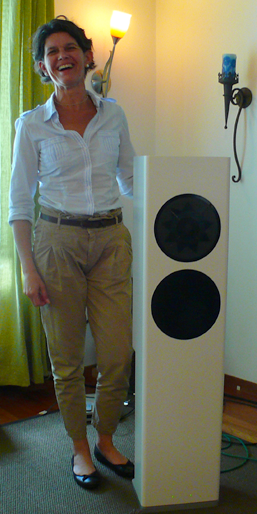 "Today we find that the type of customer primed for our solution might be an audiophile intent on downsizing not system quality but complexity; or someone who is getting into computer audio where volume-equipped DACs are getting quite commonplace; and finally regular readers of pro-audio magazines who already grasp the technical superiority of active speakers. We also have many clients in acoustic research facilities as well as studios and concert halls and were recently awarded a patent for a new microphone design that should open further doors. I would like to think that this is where pro audio and high-end begin to overlap and where established companies like ourselves, Bryston/PMC, Genelec, Klein & Hummel and others are making inroads. It's often the younger generation who wants a minimalist modern hifi/video system with great sound and comprehensive functionality that's still compact, simple and attractive. For full-range undistorted performance within a compact form factor, those demands make active drive near mandatory." Being no engineer or fluent in wave propagation dynamics, I remained rather M&M'd—Manger mystified—once Daniela and Markus had departed. My head couldn't wrap itself around how a diaphragm might freely bend and not just stretch in the absence of any mechanical suspension. But I was left with a very strong engineering focus on time-domain fidelity, point-source behavior and lack of energy storage in the actual makeup of this unique transducer. I was suspicious too that at the end of the day the true operation of this device—across its entire bandwidth—remains a more complex less linear affair on amplitude and radiation pattern than any polemic would admit. The earlier laser interferometry images certainly suggest a surprisingly broad array of diaphragm patterns or radiation modes. Even so the hifi press routinely overestimates small frequency response deviations and their deleterious effects on the listening experience. At the same time it sorely underestimates or outright overlooks the importance of being 'on time' or true to time. Beyond propaganda then and persuasive technical claims that essentially play out on paper and in the mind, how would a widebander that's so deliberately optimized for those qualities—the step response above tells that story—differentiate itself to the observant ear/brain versus more conventional solutions? What kind or flavor of sound should one expect?